Photo by Adam Sullivan Quarterback Brody Rollins rushes during the second quarter to set up their second touchdown. The head coach of the South Doyle football team, ClarkDuncan, may have been camping out for the new iPhone on Friday morning. After all, when you lead a team to a 5-0 start and shutout the Carter Hornets 23-0 at home in front of packed house, the best Gatorade bath is one in which the coach doesn’t see it coming. South Knoxville is always full of hidden gems, but the South Doyle Cherokees are starting to get some statewide attention for their undefeated season start and their wins over some powerhouse opponents. Carter received the opening kick and quickly was able to quiet the crowd with a QB keeper for 15 yards to get to the South Doyle 33-yard line. However, their opening drive stalled and the Cherokees took over on downs on their own 29-yard line. It wouldn’t be until 9:42 left in the second quarter that Jocquez Bruce would side-step a handful of tackles for an 18 yard run to the endzone to put the Cherokees up 7-0. At this point in the game, both teams had attempted less than four passes total. 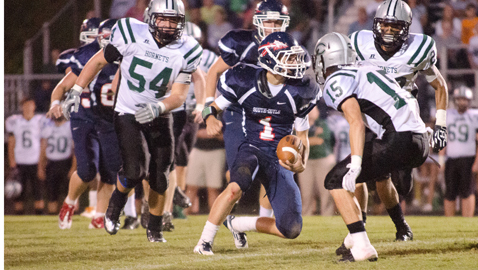 South Doyle’s defense stepped it up in the second quarter to hold Carter to their own 40-yard line before forcing a punt on their next series after the touchdown. With low expectations, Jocquez Bruce took a handoff on a third and 26 from Carter’s 37 yard line and side-stepped almost every member of the Carter backfield before crossing the goal line. The extra point was no good and South Doyle lead 13-0. Caleb Mitchell would hit an impressive 38-yard field goal midway through the third quarter to put the Cherokees up 16-0. “That was big for us. It put us up three scores and that was huge,” said Coach Duncan. Brody Rollins, the quarterback who typically makes huge gains when he keeps the ball on designed run plays, made a huge defensive interception after Carter marched down to their own 25-yard line. Rollins returned the ball for an 85-yard touchdown to put the Cherokees up 23-0. “On the return back I had two great blocks that freed me up, so I give credit to them,” said Rollins on the interception. South Doyle travels to Cherokee High School this Friday in hopes of expanding the streak to 6-0.